Let’s be honest; there’s nothing more difficult in life than choosing which movie you want to watch. Sure, bills exist, rent needs to be paid, and most of us are plagued with crippling anxiety (you know it), but they’re just a tiny speck of nothingness compared to choosing which genre, which actor, or which storyline you want filling your screen. Life is so hard. However, we can always count on one genre to fill all of our needs. Yep, we’re talking about teen romance movies. They’ll make you laugh, they’ll make you cry, and they may make you vomit from all of the cuteness – but it’s totally worth it. 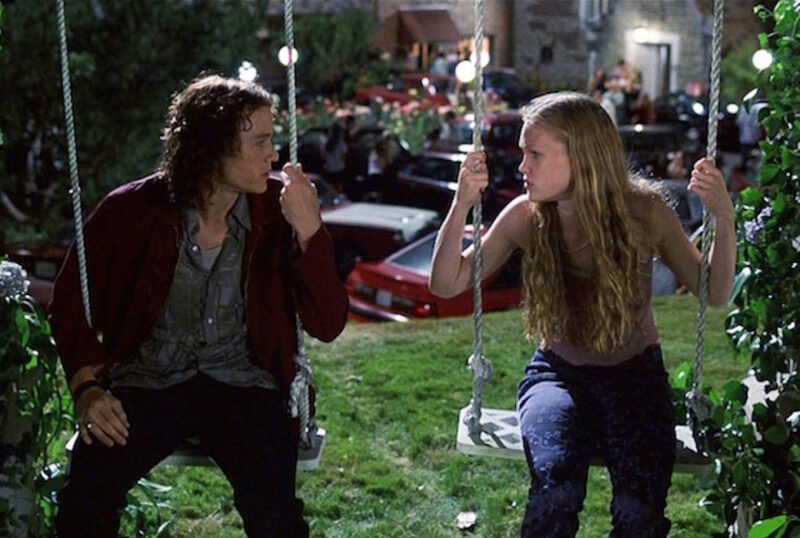 It’s no secret that 10 Things I Hate About You is basically THE BEST movie in the world – so of course, it had to be at the top of this list. More than anything, this movie brings us an all-star cast. Think Heath Ledger, Julia Stiles, Joseph Gordon-Levitt, Gabrielle Union and more. You don’t really get much better than that. This movie also brings us an awesome storyline based on the Shakespeare classic, The Taming of the Shrew. By the end of it, you’ll want to be Kat Stratford, you’ll want to dress like Bianca Stratford, you’ll want to date Patrick Verona – and you’ll want to be best friends with Cameron James (sorry for putting you in the friend zone, J-GLow). You probably remember Hilary Duff from her time on the Lizzie Mcguire show – but did you know she also did a few movies before she disappeared off the face of the earth? One of her more memorable appearances was in the incredible A Cinderella Story. Starring Chad Michael Murray (swoon), this film follows the life of a modern-day Cinderella by the name of Sam. This California girl is stuck in a rut, under the evil rule of her stepmother and her disastrous step-sisters. But then, she begins a romantic and thoughtful email relationship with ‘Nomad,’ and she soon gets her happily-ever-after. Even if you’ve never seen The Notebook, you’ve definitely heard of it – because how could you have lived your whole life without people gasping and cooing over the passionate and crazy relationship between Allie and Noah? This movie is a heartwarming adaptation of the Nicholas Sparks novel of the same name, so of course it’s bound to make you ugly cry and laugh at the same time (he likes to do that, ol’ Nicholas). Nevertheless, it’s one of the most beautiful films of all time, as well as one of the best teen romance movies. Go for it. Okay, we just had to put Grease on this list – because after all, Grease IS the word. This movie is an absolute classic and one that has to be watched at least once a year. Following the life of the T-Birds and the Pink Ladies from Rydell High, this movie focuses on the blossoming (and failing) relationship of Danny Zuko and Sandy Olson. As two completely different people on different social ladders, the pair soon find themselves frolicking at the carnival and floating off in a flying car. As you do. Are you wondering which movie to watch today? Well, here are just a few options to get you started. Or just take the day off and watch them all!